If the Scart socket is Sven Goran Eriksson, then HDMI is Steve McClaren, brought in to replace an ageing, impractical and much maligned system. This all-digital connection has ushered in a new era for home entertainment, making it possible to pipe pictures and sound between compatible kits without any pesky digital to analogue conversion. 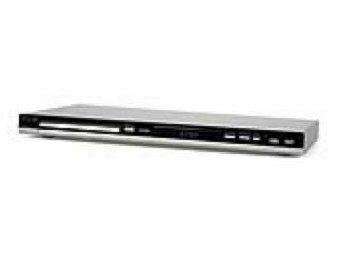 You'll find the ubiquitous socket on the back panel of this low price DVD deck from Philips, and those of you with HD Ready displays take note - the DVP5960 will up convert standard definition DVDs to 720p or 1080i to more closely match your screen's resolution. The DVP5960 is very attractive, and at 37mm high it's one of the slimmest players around. Despite this, Philips has still found room on the rear for the other key sockets, including progressive scan capable component outputs, an RGB Scart and electrical digital audio out. Only S-video output is missing. There are more goodies round the front, with a USB port that plays host to flash memory drives and digital audio players. The unit is compatible with MP3, WMA, JPEG and DiVX Ultra, the latest incarnation of the compressed video/audio format. Installation takes mere seconds thanks to a simply arranged setup menu, while the onscreen displays are basic but effective. The remote does a sterling job too, with good button arrangement and labelling. Navigating devices plugged into the USB port is easy - simply press the 'USB' button on the remote and the unit displays all the compatible files in their respective folders. There are plenty of other features on board, including a zoom mode for DVD playback, HD JPEG for viewing digital images of up to two mega pixels in their original resolution, picture adjustments and the ability to view a picture slideshow while MP3 files play in the background. Using component or HDMI output, the DVP5960 delivers superb pictures with strong, vibrant colours, a great contrast range and no evidence of blocking artefacts. What's more, edges are cleanly defined and detail remains high even during dark scenes. The 720p setting delivered the best results on our 1366 x 768 test flat panel TV, but the step-up in quality from 480i or 576p is barely noticeable, most likely because plasma and LCD TVs perform their own picture conversion to display images on the screen. The deck handled all versions of DiVX (and XViD) with no lip sync errors or picture break up, so your library of downloaded movies is in safe hands. Hooked up to a decent sound system, the deck isn't left wanting with Dolby Digital or DTS soundtracks. Stereo CD playback is wonderfully detailed and there's a decent amount of bass even without the assistance of a subwoofer. With a generous amount of features, excellent connectivity and pleasing performance the DVP5960 offers a lot for £70. What's more, its stylish looks and slimline design make it a cosmetic triumph as well as a technological one.